Scotline had a visit on Saturday 25th April from Finan Liddle, Ships Monthly’s youngest reader, who came up to Rochester to visit us. Finan was taken around the terminals and saw the Scot Carrier and Scot Mariner as they were discharging at Scotline Terminal (Medway) and Scotline Terminal (Transit) respectively. After reading the article about Ships Monthly trying to find their youngest reader, Scotline invited Finan, his father Wil and great grandfather Peter to come and visit us. 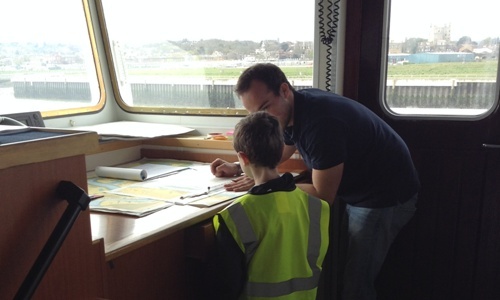 Recognising the lack of young people coming into the industry, we wanted to offer him the chance to come and get hands-on with a working vessel and also to encourage his interest in shipping further. Thanks to Finan and his family for coming to visit us and we hope this further encourages his interest in shipping.